A 100% cotton taupe cushion with fringing around the edge, and a colourful flamingo head design screen printed into the centre. 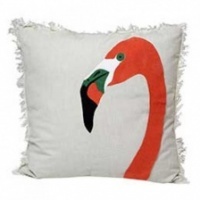 This fun and colourful cushion adds texture to any setting and looks great on a bed or sofa. 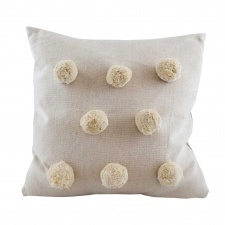 Style with any of our velvets or pom pom cushions for a stylish look. Raine and Humble textiles are made in their own factory in India by third generation cotton producers. Everything is ethically produced using traditional dying methods and innovative weaving and washing methods to give different textures.